Part machete and part sword, this hybrid cutlass saber is built to be fully functional without the high price tag. The 1075 high carbon steel blade comes sharpened and has a black epoxy finish to help protect against rust. The handle is made of injection molded polypropylene and can not be removed from the tang of the blade. 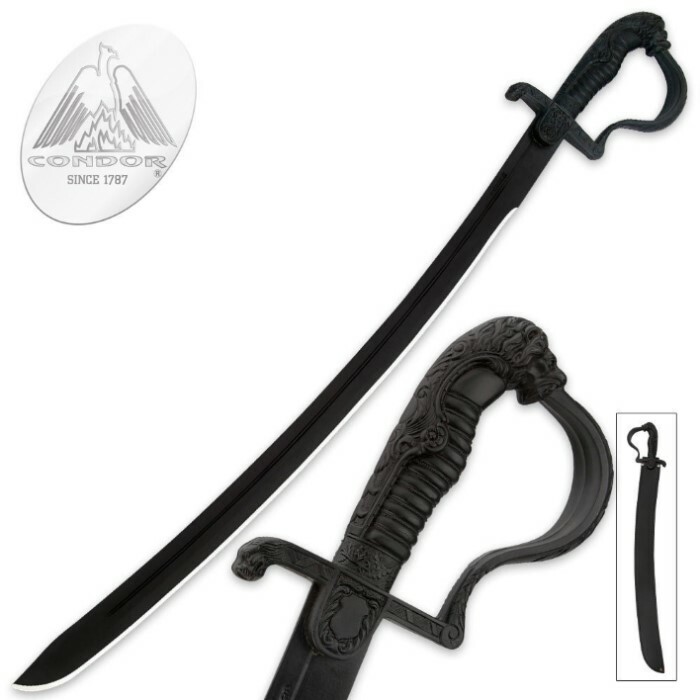 The handle uses the same material as our virtually unbreakable training swords. Ideal for clearing brush, camping, keeping next to your night stand or as a "backyard beater". Measurements: 24 in. blade, 29 1/2 in. overall. Includes a genuine leather sheath. any person from the times of the sword would have loved this 1.6lbs of sweet steel. powder coated blade for the salty sea, high impact abs handle easy care. I have smashed this thing up one side and down the other, flat blading, back of the blade, caught heavy branches at BAD angles and no damage. a few passes of the sharpener and good to go. just to pleased for my wife to be swinging this blade, she carries it everywhere, in stores everywhere. Hard to believe Condor made this product. Feels like something from the dime store with it's cheap rubber grip. It does have a nice leather sheath, but I didn't buy it for leather. I bought this because I saw Skallagrim on YouTube giving it solid props for the price so I took a gamble and got one of my own. First off...horrible, horrible handle. Plastic, with intricate "carvings", but all they do is bite into your hand. Also, and my hand isn't that big, but the guard, up towards where your pointing finger rests, is a bit thin...I can see it making impact with my finger here and there...may hurt. The blade, though...wow...very nice, thinner than expected, but that only makes it easier to swing and handle. Haven't test cut with it, but I watched Skallagrim so it and it seemed to hold up very well. After wrapping the handle in leather, which unfortunately made the space by my pointing finger even narrower...helped quite a bit...if I scoot my hand down to the bottom, I can avoid contact with the guard on a full swing. For the price, it can't be beat...very nice, attractive, and deadly sword/machete. BUY ONE! It's a fantastic machete. The blade is very resilient, and despite the hilt being plastic, it still feels nice in the hand. If you want a durable blade for backyard cutting or clearing light bush, you will probably not be disappointed. For its price, it's practically a steal.